It is no secret that I have a especially good relationship with Indian chess going back to the days - the mid 80's - when I was Executive Secretary of the Malaysian Chess Federation. K. Muralimohan is one of the nicest persons you can imagine - despite his physical handicap he has been a tireless worker for chess: a very respected and giving chess trainer, prolific author of chess books, and long serving Secretary of the Tamil Nadu Chess Association. 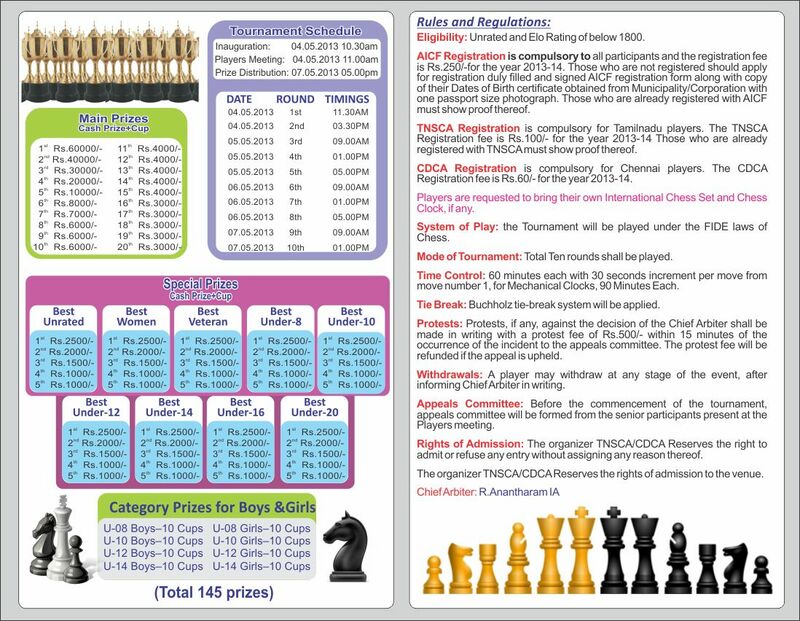 Tamilnadu State Chess Association is organizing Muralimohan Benefit All India FIDE Rating Chess Tournament (for Below 1800 Rating) at Velamma School, Mogappair, Chennai-37 from 4th to 7th May 2013. the Total prize fund is Rs.300000/-. Entry fees Rs.2000/2300/2500. Out station players will be provided free Lodging, like dormitory type class rooms. This is a benefit tournament for Mr. K. Muralimohan (former TNSCA General Secretary, International Arbiter, National Level Chess Player, Chess Coach, Author of many Chess books, etc.) has now been diagnosed for cancer. 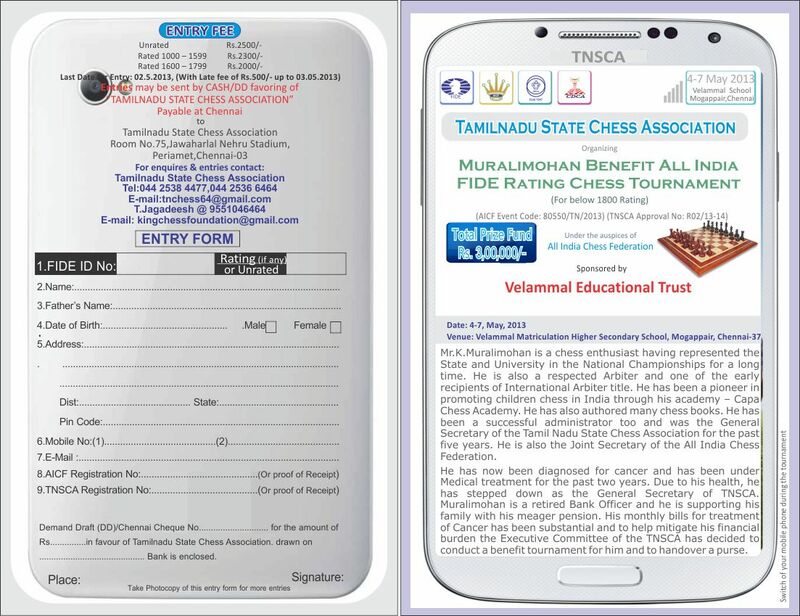 In order to meet his medical expenses, TNSCA is organising a rating tournament for the benefit of Mr. K. Muralimohan. 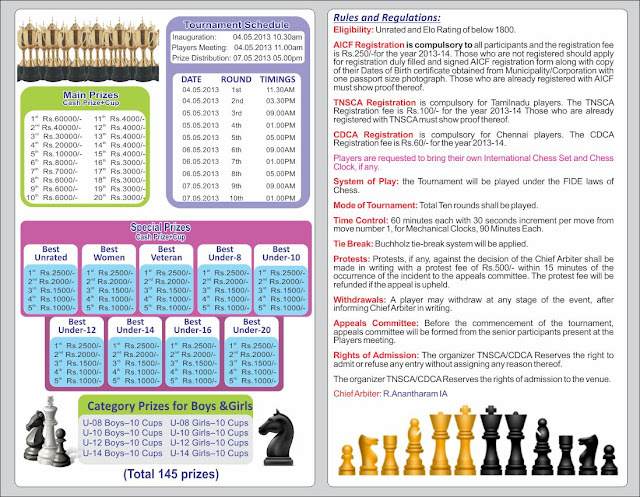 We request all Chess lovers (Who are eligible) to participate in this tournament.